Whitney review: "A hugely accomplished work"
Macdonald leaves no stone unturned in this tremendous look at Houston, one that sheds real light on the singer’s psychology. A year after fellow Brit Nick Broomfield, Kevin Macdonald tackles the enigma that is Whitney Houston in this sure-footed documentary. The difference from Broomfield’s Whitney: Can I Be Me is huge. Macdonald’s film is authorised, with full access to family and friends thanks to Whitney’s sister-in-law Pat Houston, who takes an executive producer credit. As such, Macdonald is given free reign to deep-dive into the singer’s life, from gospel-singing child to teen hit-maker to global superstardom. Impressively, he covers her cultural impact with aplomb, from being booed at the 1989 Soul Train Awards (for reportedly being a sell-out) to her majestic rendition of The Star-Spangled Banner at the 1991 Super Bowl. Interviewees include brother Gary Houston, confidantes such as former assistant Mary Jones, hair stylist Ellin LaVar and talent agent Nicole David, and even her notoriously reticent ex-husband Bobby Brown, who refuses to be drawn on the drug abuse that preceded Houston’s demise in 2012, when she was found dead in a hotel bathtub aged 48. 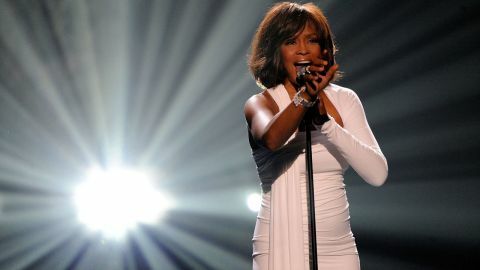 Compared to Broomfield’s patchy film, Whitney feels definitive, whether it’s Kevin Costner discussing barrier-breaking interracial romance in The Bodyguard, or a poignant encounter with Houston’s mother Cissy, a former gospel singer, in her local church. “She was a good baby... everybody loved her,” she says, close to tears. Despite the access-all-areas nature, Macdonald never lets this become a sanitised bio-doc. Eschewing the idea that Houston was simply drawn towards a drug-fuelled existence (although plenty of those on camera attest to her love of partying), he even unearths some shocking childhood revelations that help reframe ideas about why the American sweetheart who sold 200 million albums went down such a tortured path. While it’s not quite as emotional as Amy, Asif Kapadia’s Oscar-winning Amy Winehouse doc, Whitney is nevertheless a hugely accomplished work. Macdonald and his editor Sam Rice-Edwards do a fine job in remembering her talents as well as her tragedies. Employing some expertly sourced archive footage, exhilarating montages remind us of the Reagan-era America in which Houston came to prominence. As the film unfolds, there’s also a huge amount of sorrow and guilt expressed by those around her, towards both Houston and her daughter Bobbi Kristina Brown, who died in 2015 aged just 22. Here and elsewhere, Macdonald approaches his subject with real sensitivity and skill, delivering his best film since 2003 docu-dram Touching the Void.